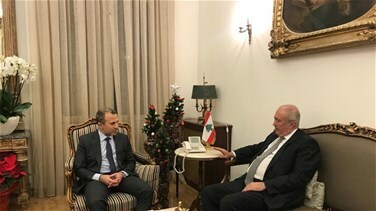 Caretaker Foreign Minister Gebran Bassil received Thursday MP Fouad Makhzoumi, who congratulated him on his stances over the Israeli violations on the Lebanese border. "We discussed the formation of the government, and I believe that reports of a deadlock are inaccurate. Many solutions exist, and we all need to work so that there is no weak or loser. It is in no party’s best interest that PM-designate Saad Hariri is weak in any equation that may be reached, but at the same time, we must all work together because the country's unity and interests helps us overcome the economic situation," Makhzoumi said. Makhzoumi described the meeting between Finance Minister Ali Hassan Khalil and Governor of the Central Bank Riad Salameh as "important and soothing to the financial markets for a certain period."